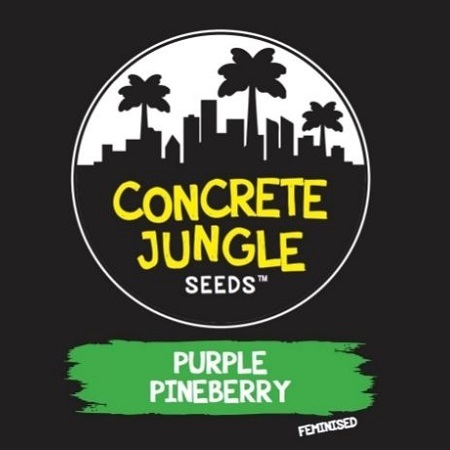 This vigorously growing variety offers plants with a growth structure like a small Christmas tree..
Purple Pineberry Feminized Cannabis Seeds by Concrete Jungle Seeds: This vigorously growing variety offers plants with a growth structure like a small Christmas tree, with very tight internode distance. During vegetative growth the broad leaves will have a lush, dark green colour. Particularly resistant to mould and pests in general, it is an great option both for beginner gardeners and for cannabis cultivation experts. 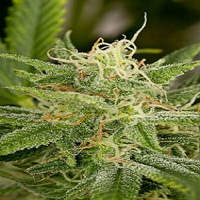 It can be grown without problems indoors, but is also well-known for its excellent outdoor results. 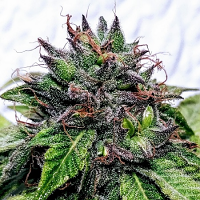 If the plant experiences cool temperatures at the end of the flowering cycle, it is possible to harvest dense, extremely resinous buds with a most attractive purplish colour. The earliest phenotypes will be ready to harvest after 6 weeks of flowering, for an abundant harvest which can reach 500g per m2. The effect is typical of Indicas, with a THC content of 19.5% but also a touch of CBD (1.3%) which offers a feeling of deep relaxation. Ideal to relieve stress and tension, both mental and physical, perfect for consumption in the evening or iin our free time. The flavours blend very well, with the fresh notes of pine perfectly complementing the fruity background of the Blueberry genetics.